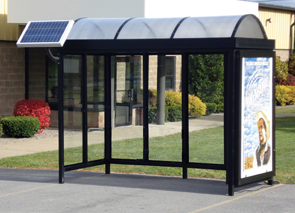 These modular prefabricated barrel roof bus stop shelters are ideal for providing shelter for passengers in waiting and to help encourage the use of buses, shuttles, railway transit and other similar transportation. Another purpose these shelters are well suited for is protection from the elements for smokers, a smoking shelter allows for smoking code compliance. Maintenance free aluminum framing with anodized finish. Three Styles of Bench Options Available: Standard, ADA, Anti-Vagrant. Optional Map/Schedule Holder Available in your choice of Bronze or Clear Anodized. Optional Exhaust Fan, Lighting, Heating Accessories Available. Optional Solar Powered Lighting Kits Available. Ad Panel is Not Included. Modular shelter is fabricated from a low maintenance, lightweight corrosion resistant aluminum. Structural aluminum frame is extruded 6063-T6 aluminum and is available in Quaker Bronze finish. One piece roof assembly includes 1/4" translucent twin wall polycarbonate. Fixed windows are made from of single pane 1/4" clear tempered safety glass, mounted into easily replaceable extruded aluminum frames.